With so many different frames, foundations, and types of beds to choose from, you may be wondering where exactly to start looking for the right foundation for your memory foam mattress. Below, we’ve covered the best types of foundation for a memory foam mattress and provided our top picks. Our top pick for the best memory foam mattress foundation is the Zinus Steel 1500H Platform Bed Frame, which has a sleek, simple design that provides a sturdy surface suitable for any foam mattress with plenty of storage space underneath. Our second choice is the Olee Sleep Steel Slat Bed Frame, providing a durable minimalist foundation that offers excellent value for money. Memory foam mattresses are extremely versatile and are designed to provide a supportive sleep surface, even if you place your mattress directly on your bedroom floor. However, many people opt to purchase a foundation alongside their mattress, to keep it away from dust and debris on the floor, promote airflow, and to make it a more comfortable height for getting in and out of. Traditionally, box springs were the most common foundation used for mattresses. However, box springs with coils tend to flex in order to distribute weight, which can cause a memory foam to sag in places. The Zinus Steel 1500H Platform Bed Frame has a steel frame and sturdy wooden slats to provide a simple foundation that is easy to assemble. With plenty of storage space underneath and excellent ratings for its stable design and durability, this bed frame provides the ideal simple yet reliable foundation for your memory foam mattress. You want a simple, minimal design: This bed frame is simple in design, with a black steel frame, minimalist headboard, and no footboard. If you are looking for a foundation that will blend effortlessly into your current interior design, this is a good option. You want a memory foam foundation with wooden slats: Foundations with wooden slats can provide slightly more give than a solid platform, which is something to bear in mind when considering what is best for you. This frame has wooden slats measuring 3.47-inches on the Queen and King-size models, and 3.08-inches on the Twin and Full-size models, both of which are suitable for memory foam mattresses. You need storage space under your bed: With 12-inches of clearance space under the frame, the Zinus Steel 1500H provides plenty of storage space in your bedroom. 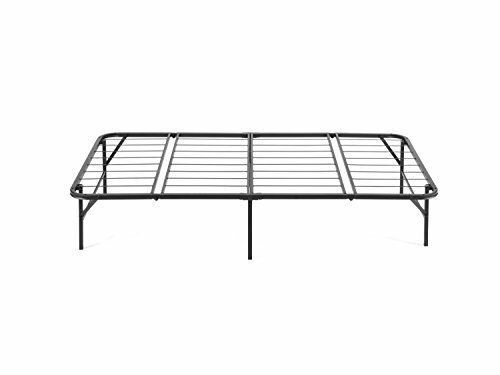 The Zinus Steel 1500H Platform Bed Frame is constructed from a black steel frame available in Twin, Full, Queen, and King sizes. It comes with a headboard included, measuring 38-inches in height in total. A great feature of this bed frame is its 12-inches of clearance space, making this foundation perfect for small rooms where under-bed storage space is a necessity. The Steel 1500H has wooden slats running across the frame, with slat spacing measuring 3.47-inches for the Queen and King-size models, and 3.08-inches for the Twin and Full-size frame. Using a bed frame with wooden slats spaced too far apart can cause memory foam mattresses to sag and may even void their warranty, but the narrow slat spacing on the Zinus Steel 1500H makes it suitable for any foam, innerspring, latex, or hybrid mattress. The wooden slats provide a slightly more flexible surface than a metal or solid platform bed, so this design may be suitable for you if you prefer a little give in your mattress, rather than a completely firm sleep surface. Another highly-rated feature of the Zinus Steel 1500H is its ease of assembly. Zinus include detailed instructions and everything you need to set up the frame upon delivery, meaning no extra tools are required to assemble the parts. Zinus provides a five-year warranty with all their beds and bases and you’ll also get a 100-night sleep trial when you purchase this frame. If you don’t like the base within those first 100 nights, you can return it and receive a full refund. Overall, this is bed frame receives excellent reviews for its easy setup, sturdy, simple design, and fantastic price. If you’re looking for a reliable, no-frills foundation for your memory foam mattress, you can’t go wrong with this option. The Olee Sleep Steel Slat Bed Frame is a robust bed frame that promises to provide a squeak-free foundation for your memory foam mattress. Made from solid steel with rounded edges for added safety, this is another simple memory foam mattress foundation that ticks all the right boxes. You want a solid metal foundation: Constructed with a steel frame and slats, the Olee Sleep frame provides a solid and seriously strong surface for your mattress. You want storage space under your bed: This bed frame has 13.5-inches of clearance under the bed, providing plenty of space for storage boxes or any items you need to stow away. You prefer a firm sleep surface: With strong metal slats for placing your memory foam mattress on top of, the Olee Sleep Bed Frame provides no give as a foundation – perfect for sleepers who want their memory foam mattress to remain as firm as possible. The Olee Sleep Steel Slat Bed Frame is very simple in its construction, made from 100 percent steel in both the frame and the slats of the foundation. The frame itself is made with rounded edges for added safety when manoeuvring around the bed and the brand promises the sturdy steel design will provide a squeak-free surface when sleeping. The metal slats are spaced 6.3-inches on the Twin and Full-size frame, and 6.1-inches on the Queen and King-size frame, ideally suited for placing your mattress directly on top with no need for a box spring. With 13.5-inches of clearance space under the frame, the Olee Sleep Steel Slat Bed Frame is another foundation that is ideal for use in smaller bedrooms where additional storage space is necessary and the minimal design of this frame will blend perfectly with any interior design scheme. With a five-year warranty, the quality of this metal foundation speaks for itself. Olee also offers a 30-day trial period in which you can return the product for a full refund if you are not satisfied with it. This frame receives excellent reviews for its easy assembly and sturdy, sleek design. If you are looking for a strong metal foundation for your memory foam mattress, the Olee Sleep Steel Slat Bed Frame provides a reliable option. If you want an adjustable foundation for your memory foam mattress, you can’t go wrong with the Leggett & Platt Prodigy 2.0. Featuring a wide array of premium features, including anti-slip technology, full-body wave massage, and app controls, this is a fully customisable foundation to suit any sleeper. You want to customise your sleep position: This foundation provides the option to raise your head, feet, or both, to help you find the perfect sleep position. This feature is also particularly handy if you have trouble getting in and out of bed. You want to adjust the height of your bed: The Prodigy 2.0 comes with adjustable legs, allowing you to fully customise the height of your bed to suit your needs. If you have a tall mattress or mobility issues, the ability to lower your bed frame to a more suitable height can be helpful. You plan to use your bed for relaxation as well as sleeping: Adjustable bed bases can transform your bed into a place to unwind after a long day, not just to sleep. Featuring a full-body wave massage feature and programmable positions, the Leggett & Platt Prodigy 2.0 provides plenty of opportunities to fully relax. If you have a bigger budget to spend on your memory foam mattress foundation, an adjustable bed base like the Leggett & Pratt Prodigy 2.0 can really transform your sleeping experience. The Leggett & Platt Prodigy 2.0 is a premium adjustable bed base with a wide array of features to provide a fully customisable foundation for all sleep preferences. Key features of this adjustable bed base include MicroHook™ technology, which will prevent your mattress from slipping as the bed moves, a capacitive-touch remote with programmable positions, and app controls with a sleep timer and gentle-wake alarm. Adjustable bed bases are ideal if you enjoy relaxing in bed before sleeping. You can customise your head position to watch TV or read comfortably and can even enjoy a full-body wave massage to really unwind before bed. Another great feature of the Prodigy 2.0 is that you can adjust the legs to a height that suits you. If you have difficulty getting in and out of bed or just want to avoid having a bed that is too low or too high, being able to adjust the height of the legs of the frame is a useful bonus. Leggett & Platt offer a 1-3-25 warranty on their adjustable bed bases, which means you’ll have a full warranty for the first year, a limited warranty for the second and third years, and another limited warranty for the remaining 22 years. With so many fantastic features, the Leggett & Platt Prodigy 2.0 is a strong contender for a memory foam mattress foundation when price isn’t at the top of your concerns. Although the most expensive option on this list, you’re paying for the ultimate customisable sleep experience. If you’re looking for a memory foam mattress foundation that raises the profile of your bed, you can’t go wrong with the Zinus Steel BiFold Box Spring. Constructed from a solid steel frame covered with a polyester jacquard cover, this is a simple yet stylish foundation to provide a solid surface for your mattress. You want to raise the profile of your mattress: If you plan you keep your mattress on the floor or a very low frame, this box spring foundation is excellent for raising the profile of your mattress. Available in 4.5, 7, and 9-inch heights, this box spring is perfect for elevating your mattress to a more comfortable height. You want a foundation that is easy to assemble: The BiFold design of this box spring makes it extremely easy to assemble with no tools required. If you are looking for a foundation that is ready to go when delivered, this is a good option. You want a box spring without coils: Box springs are extremely useful for raising the profile of your bed, but many box springs are made with coils that are unsuitable for use with a memory foam mattress. The sturdy steel frame design of this box spring makes it ideal for use with any foam mattress. 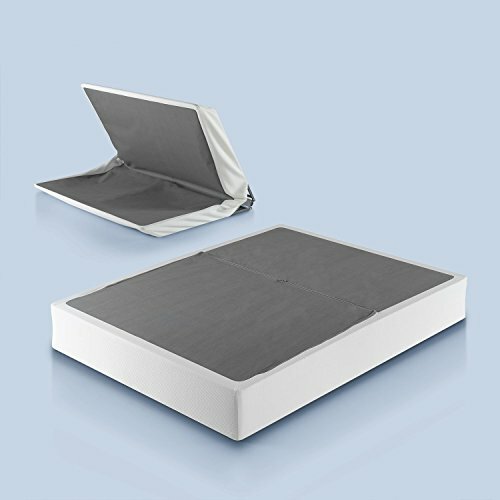 The Zinus Steel BiFold Box Spring is available in three different heights: 4.5, 7, and 9 inches, and is an ideal memory foam mattress foundation if you have a low-profile bed frame that makes getting in and out of bed difficult. If you want to raise the height of your bed but want to avoid using a traditional box spring with a wooden frame and coils, the Zinus Steel BiFold provides the ideal solution. Made from a solid steel frame covered in a polyester jacquard cover, this box spring is perfect for use with a memory foam mattress, with strong metal slats that won’t cause your mattress to sag. The Steel BiFold Box Spring can hold a total of 550-lbs excluding the mattress, making it suitable for most sleepers and heavier foam or hybrid mattresses. This foundation receives excellent reviews for its ease of assembly. The Steel BiFold Box Spring is delivered in a box and simply needs to be unfolded to be ready for use – no tools required. All Zinus bed bases come with a 100-night sleep trial, so you can make sure the box spring is the correct height for your needs and provides a comfortable surface for your memory foam mattress. What’s more, you’ll get a 10-year warranty with your purchase, so you can have the peace of mind that you’re investing in a brand who have confidence in the quality of their products. Overall, if you need a memory foam mattress foundation to raise the height of your bed for a more comfortable sleeping experience, this sturdy steel box spring is ideal for supporting you and your mattress. If you need a foundation that will comfortably support your weight and that of your memory foam mattress, look no further than the Classic Brands Hercules Metal Bed Frame. With a weight capacity of up to 2400-lbs, this heavy-duty foundation is our top pick for heavier users. You want a foundation that is easy to assemble: The Classic Brands Hercules Bed Frame requires no tools to assemble and is highly rated by users for its ease of set-up, once delivered. If you want a fuss-free frame, this is a great option. You want a simple, minimalist design: This bed frame will let the rest of the decor in your bedroom really shine. Constructed with a sleek, black steel frame, this foundation will blend perfectly into any interior design theme. You want a foundation with a high weight capacity: Able to hold 2,400-lbs, this metal foundation is perfect for users who want a sturdy and durable bed frame. The Classic Brands Hercules Metal Bed Frame has a simple black steel frame, which is delivered folded in a thin box that requires no tools to set up. 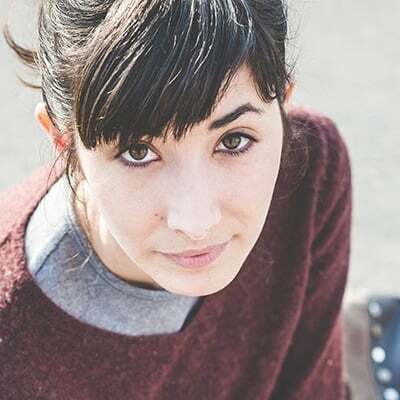 The legs come with caps included to protect your floor, while the frame itself is made from heavy-duty metal, able to support any mattress without the need for a box spring. A great feature of the Classic Brands Hercules frame is the 13 inches of space under the bed, providing plenty of room for storage. Combined with a simple, fold-up design, the Hercules bed frame could be used for a spare bed or as a permanent piece of bedroom furniture. Not all memory foam mattress foundations are made to support larger weights, so this heavy duty frame’s high weight capacity is a standout feature. Capable of holding 1,200-lbs on the Twin size bed, and 2,400-lbs on the Full, Queen, and King size frames, this foundation is suitable for any foam, spring, hybrid, or latex mattress, and for heavier users. While this foundation doesn’t appear to come with a sleep trial period, it does come with a three-year warranty. Combined with its very reasonable price, this simple metal foundation is a solid, sturdy choice that is well reviewed for its durability, easy assembly, and minimalist design. Slat spacing: Memory foam mattress are not suitable for foundations with widely-spaced slats, as these can cause the mattress to sag and lose its shape. Foundations with a flat, solid base or narrow slats are the best option. Height: Having a bed that is too high or too low can make getting in and out of bed extremely uncomfortable, so make sure the height of your foundation will suit the overall desired height of your bed. Material: You want a foundation that is going to last, so considering what your foundation is made of is important. A steel foundation is going to provide the most sturdy, durable foundation, although a well-built wooden foundation can still be effective. Size: Your foundation needs to be the same size as your mattress, so be sure to double check the measurements before buying yours. There is a wide range of foundations that can be used with your memory foam mattress. The key thing to consider is first, if the foundation you are looking at is compatible with memory foam and second, what features are essential for you, such as storage space, material, and height. We hope that our top picks for the best memory foam mattress foundations have helped make your decision easier.